Do universities have an ethical role to play? UC Santa Cruz Campus Provost and Executive Vice Chancellor Marlene Tromp will join Aptheker in conversation. The newly restored and reopened Quarry Amphitheater is the biggest event space on the UC Santa Cruz campus, with 2,000 seats. But the revered feminist studies professor Bettina Aptheker is likely to fill the joint during Alumni Weekend 2018, where she will make a passionate defense of universities as places of ethical and critical thinking. In fact, she would surely “raise the roof” of that place during her faculty keynote address, if only the amphitheater had a roof to raise. She will be in discussion with UC Santa Cruz Campus Provost and Executive Vice Chancellor Marlene Tromp—an event that is sure to be one of the highlights of Alumni Weekend, which runs April 27–29. Much more than a reunion, this three-day celebration is an extravaganza of good food, fascinating lectures, special behind-the-scenes tours, exhibits, talks, wine receptions, and even a “fun run” for the athletically inclined. The Aptheker-Tromp talk takes place Saturday, April 28, from 11 a.m. to 12:15 p.m. Attendants are strongly encouraged to register for this event in advance. Tromp, a respected Victorian and Edwardian scholar and the author of several books, was a professor of English and women and gender studies at Arizona State University’s West Campus before coming to UC Santa Cruz. She also spoke with caution and concern about the ongoing “de facto privatization” of public education. “There has been a very strong, and I think profoundly unfortunate, push for years, more recently by what we now call the ‘alt right,’ but also from conservative Republican administrators, starting in the early 1990s, to privatize public education, even before they started cutting funding for public education in California and other parts of the country,” she said. She spoke of increased tuition at UCs, driving universities to raise more money from private sources to help fund teaching and research. 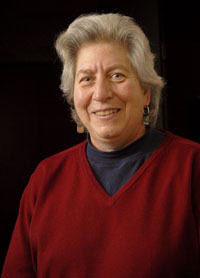 “You can’t have a democracy if you don’t have a population that is educated in critical thinking,’’ said Aptheker, who is a distinguished professor and Peggy and Jack Baskin Foundation Presidential Chair for Feminist Studies. “Just think of the problem of education in general, the underfunding of (K-12) institutions, as well as state and community colleges. The other thing that is important to recognize is that this successful cutting of funding for public education coincides with increasing numbers of students who are people of color. But she also looks forward to an audience of alumni for personal reasons. Aptheker, who has taught at UC Santa Cruz since 1980, and sometimes runs into former students during her world travels, said she loves alumni events. And recently, university staff calculated how many students she’s taught over the years.